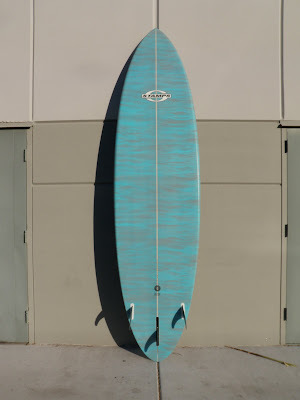 This board is basically new- it's been ridden twice and it's going to go for $950 and comes with a nice Future Fins Gerry Lopez thruster set of fins. This is basically a slightly larger version of the board that I ride. 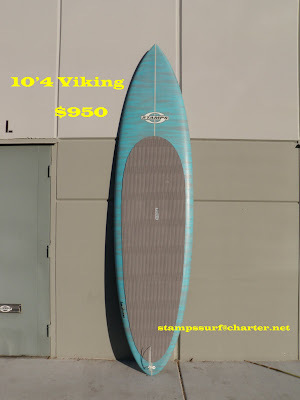 The design is called the Viking and if you know how to surf, you can make this board sing. It's not a beginner's design, this isn't a point-and-shoot kind of deal. You don't lug a Porsche around at a grand and wonder why it's not performing- you gotta have the guts to bury that tach to the right 'til she starts snarling back at you- that's when it comes alive. The same is true for this board- you've got to surf it with balls. The Viking is made to be driven, if you understand the dynamics of flow and what it means to pump for speed (no hopping) then this is your board.